We just bought a Sun Ray 2 Virtual Client and start playing with this silent device. It's not yet clear for us what JDS, UTTSC, VDA, VDM and kiosk mean but the Sun Ray Server is up and running on our Solaris 10 server. The device can be seen as "a terminal using a VNC-like protocol, with sound, USB and a card reader". I think we will buy a new one soon and release a litlle something (as innovative as jOpenDocument was). 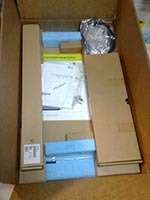 We just received a Sun Storage 7110 to test the server as part the Try&Buy program! Performance are awesome, a complete review will follow.